WAPT Pro allows sending the generated HTML Report to any interested person on test completion. For this, you should configure the following settings on the E-mail tab of settings dialog. SMTP server: Enter the name of SMTP server. Port: Here you can change server port number. Default port is 25. 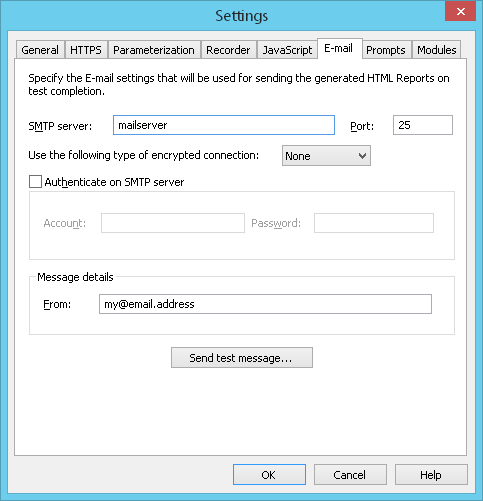 Use the following type of encrypted connection: Here you can choose the type of encrypted connection for sending WAPT Pro e-mails. By default, the program uses the non-encrypted connection (the option "None" is selected by default). Authenticate on SMTP server: Enables to authenticate on SMTP server that requires authorization. Enter your account credentials: Account and Password. From: Here you should specify sender's E-mail address. Note that the address should be supported by a specified SMTP server. Send test message..: Click this button to test your e-mail settings. WAPT Pro will send a test message using the settings you have specified. Now you can switch to the Report Options, turn on the E-mail HTML report to option and specify desired addresses where the generated reports will be sent to.